Shared Apex Loop - SAL antenna general information, tips, related links and downloads. Introducing the Shared Apex Loop Array Mark-II version TM! Improved version, now with aluminum mast. Now, you have a new interference fighting weapon in your receiving arsenal. The Shared Apex Loop ArrayTM is a revolutionary receiving antenna that will change the way that you listen to the radio! The patented design provides performance in a size and over a range of frequencies that will please both the rag-chewer and DX’er alike. The antenna is a true time-delay array with four identical wire loops supported by a single conductive mast. Signals from each loop are transferred through a ferrite coupler to a short balanced line that connects to the switch/combiner/amp/BCB filter (bypassable filter) enclosure mounted at the base of the antenna. Within this enclosure, signals from each loop are routed either directly to a combiner or through a delay line and then to the combiner, where they are amplified by a dual stage balanced broadband amplifier and sent out to the feedline to the controller located in the shack. The controller connects directly to your receiver, and sends power and control signals over the feedline to the antenna. NOTE: See the graph and table below to see how the footprint is reduced if you don't use the outer stakes. For each of these models there is a "DX" version that does not include the mast, stakes and 15 V DC power supply, making it affordable by reducing the overseas shipping costs. Without stakes: You can save around 8 feet (2.44 m) beyond the outer corners of the loops if instead of using the outer stakes you anchor the outer corners of the loops directly to non conductive posts (like 4" x 4" wooden posts). You can elevate the antenna to avoid problems with deer, people or vehicles. Simulations show that the optimal height of the antenna's lower wires at a given frequency is one quarter wavelength, therefore there is room for improvement going up. The standard height of the old model was given by the effective height (44.5 inches or 1.13 m) of the mast sections used. The new model has a bottom section of 4 feet (1.22 m), you can add more aluminum to that bottom section and use non conductive poles for the outer corners of the loops if a higher minimum height above ground is needed. How far from the transmit antenna and metallic structures? 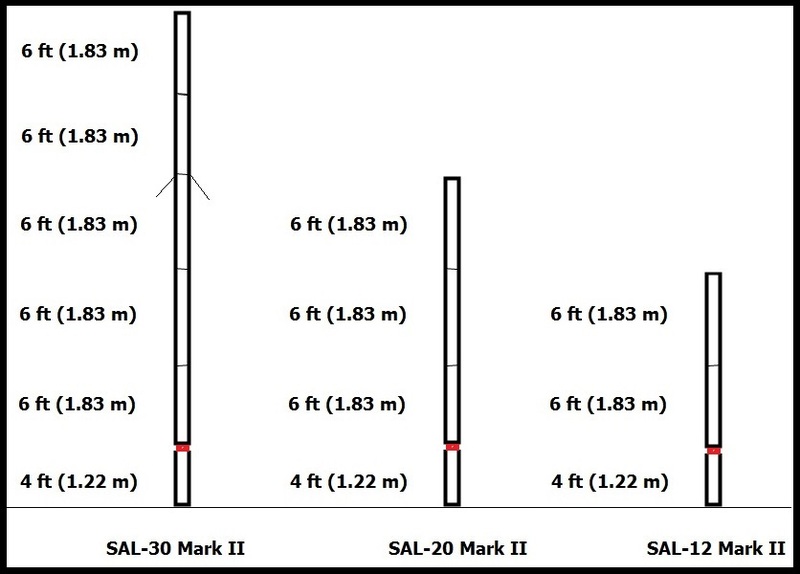 To protect the MOSFETs (J309 or J310) in the pre-amplifier circuit located in the combiner from the RF field of a transmitting antenna on 160 m band with 1500 W the minimum distance recommended is 100 feet (30.48 m) further away is better. Please check on the Yahoo Group of SAL antenna users at the bottom of this page for the back-to-back diodes solution installed at the input of the pre-amp to protect the MOSFETs, you can learn and evaluate the cons, pros and opinions on this solution. The coaxial cable feed line, how long can it be? 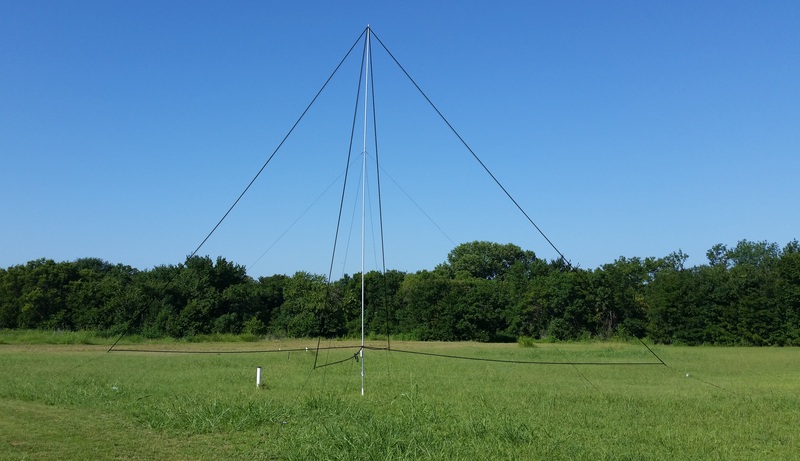 Until now, there are installations that have up to 1400 feet (426.72 m) of RG-6, as long as the voltage drop to the combiner leaves at least 12 V DC, the antenna will work. An RG-11 coaxial cable or the LMR-400-75 (the 75 ohm version of the LMR-400) would have less voltage drop than the RG-6 for longer runs. If we learn of a working longer RG-6 run we will update the information here. NOTE: The Japanese version of the manual is for the old SAL model but it is helpful for Japanese readers if you keep in mind that the difference with the new model is the replacement of the four vertical sides of the loops by a single conductor, shared by the four loops, made of aluminum. At www.hamation.com you can download the free software, "Control Center", that contains the software of the windows shown above and much more to control and share band data information for several daisy-chained Hamation controllers for selection of antennas, control of StackMatches, control of the several vertical antenna arrays like the Four Square, Triangle array, Two vertical antennas array, filter selection automation and more. You can define and name at convenience certain antenna combination as a virtual antenna on a Stackmatch, or on a vertical antennas array, define a primary and a secondary antenna -virtual or not- for a given band on RX and a different one for TX.